Caitlin R. Kiernan's Black Helicopters is an atmospheric, ultra-dark fantasy novella that manages to do modern-day Lovecraftiana oh-so-right. Creepy twins, cosmic horror, and shadowy conspiracies combine to create a mind-bending reading experience. Is the best Lovecraftiana the stuff that strays furthest from the mythos? Why were conspiracy theories so awesome in the 1990s? How can a book that doesn't focus on plot OR character be so damn satisfying? 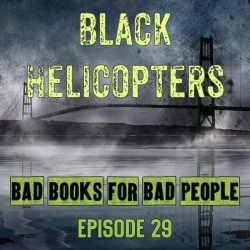 This episode of Bad Books for Bad People dares to answer all these questions, plus learn about a home-made version of The Crow, haunting tales from gym class, and Operation Midnight Climax! Find us at BadBooksBadPeople.com, on Twitter @badbooksbadppl, Instagram @badbooksbadpeople and on Facebook. You can discover where to get all the books featured on Bad Books for Bad People on our About Page.